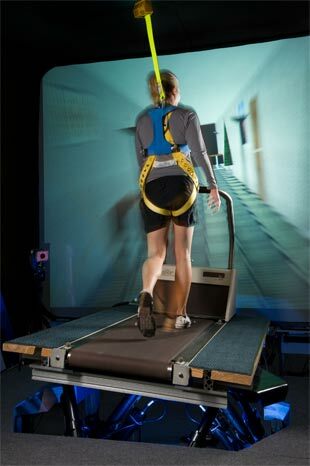 Called an Adaptability Training System, the treadmill has a projection screen in front of it that shows an image of a room or hallway that moves as the user walks. Disturbances are simulated by tilting the treadmill in one direction as the image is tilted in another. “At first, people find it difficult to walk on the treadmill since its movement and images are out of sync. But over time, they learn to walk on it efficiently. We call this concept ‘learning to learn,’” said Bloomberg, who is the associate team leader of NSBRI’s Sensorimotor Adaptation Team and a senior research scientist at NASA. In addition to maximizing training efficiency, Bloomberg is looking at how long the benefit of the adaptability training lasts. Once subjects master the treadmill, they come back periodically for testing to see how well they perform. He is investigating if subjects can retain the training for up to six months, which would allow the training to take place before a long space mission. Another goal of the researchers is to integrate a version of the system into the treadmill on a spacecraft, allowing astronauts to perform adaptability training on long missions. Integration would save space and power, both precious commodities on a spacecraft. From NSBRI press release via MedGadget.